RGS-PR9000-A is advanced Layer 3 modular managed redundant ring Ethernet switch with 3 module slots. The switch is designed for power substation application, fully compliant with the requirement of IEC 61850-3, IEEE 1613. It also supports routing protocols OSPF which are suitable for large scale network environment. With completely support of Ethernet Redundancy protocol, O-Ring (recovery time < 20ms) and MSTP (RSTP/STP compatible) can protect your mission-critical applications from network interruptions or temporary malfunctions with its fast recovery technology. Otherwise, support wide operating temperature from -20 oC to 60 oC when running with 10G ports, and it’s up to -40 oC to 75 oC without 10G ports. 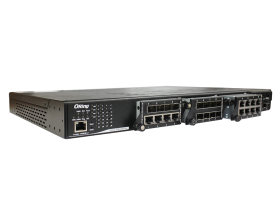 RGS-PR9000-A can also be managed centralized and convenient by Open-Vision, besides the Web-based interface, Telnet and console (CLI) configuration. Therefore, the switch is one of the most reliable choices for power substation application. Green Blinking: Indicates that the Ring is broken. .
Power Consumption (Typ.) 46Watts max. 43.5Watts max.